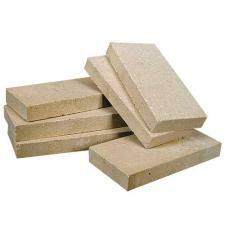 Intermediate Duty fire brick you can use to build a new fire box or to replace broken fire brick in wood stoves or fireplaces. Firebricks can be cut if necessary with a masonry blade on a circular saw or can be scored and broken to fit. Service temperature 2200 F meets ASTM C-20, C-16, C-113, C38 and C-133. Each brick measures 9" x 4-1/2" x 1-1/4"